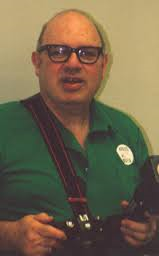 This entry was posted in 70s Fanhistory, In Passing, Worldcon and tagged Discon II, Jay Kay Klein by Mike Glyer. Bookmark the permalink. When I started going to conventions (in 1969) he seemed to be at everyone of them. OF course, back then when dinosaurs walked the earth, it was possible to go to pretty much all of the conventions on the East Coast. I was glad to read that he had donated his photos to the Eaton collection. May his memory live on. When I first began attending conventions, I thought he was an annoying guy with a camera. THEN I found out who he was (and whenever I* had the chance, I made room for him). Jay Kay will be sorely missed. Oh, I’m going to miss him. So glad that he donated his photographs to a collection – but not in the least surprised. He was an institution. I hope someone has the time and ability to make all his photos available in some sort of digital archive, with names and dates as much as possible along with the photos. Back when I worked worldcons ( 1976-1980, the early modern primitive period of conventions), I found Jay both annoying and sweet. Annoying, because, yes, wherever the action was, he was always there, and sometimes “there” was where I wanted to shift people around for better traffic flow or to preserve views for the honored guests we’d just seated in the front row. Sweet, because he always moved fast to accommodate whatever we needed. Not necessarily as fast as I wanted in my youthful impatience, but really, fast enough. Jay Kay worked for General Electric, doing advertising and other work for them which involved him, yes, taking photos. 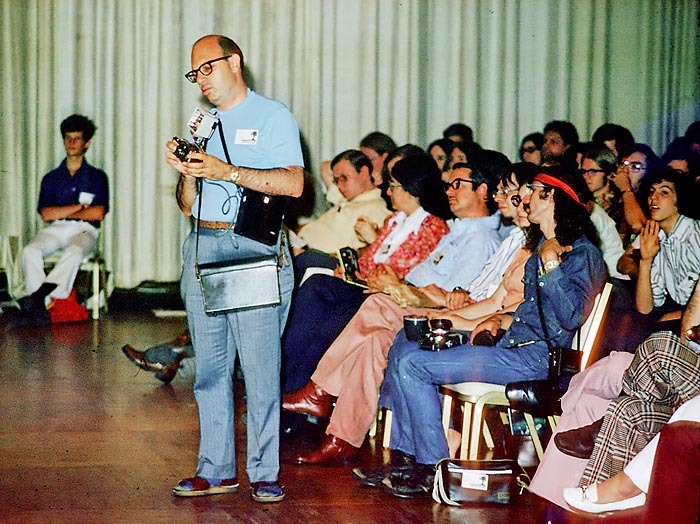 I saw him at several IEEE conventions and trade shows in NYC in the 1960s and 70s, in his mundane guise. He had a large collection of now-vintage Leica cameras which he used in his pro and fan work, and walked around with a camera bag which weighed quite a lot. He’d learned photography in the days before zoom lenses, and his bag always contained many rolls of film and numerous lenses. He’d had heart problems in the 1990s, and told me he was on medications which adversely affected him—so he stopped taking them. This is sad news. The first time I met Jay Kay Klein was at MidAmeriCon, and then kept seeing him at assorted cons. Didn’t know him that well, but he was always where the action was. Thank you for the very nice obituary about Jay Kay, Mike, and everyone’s comments here prove how much he will be missed. Sorry to hear abut JK. He will be missed indeed. I guess he’s taking pictures at the Consuite of the Celestial Tucker Hotel now. Jay also had a lovely singing voice, which not enough people knew about. We tried to encourage him to join us in concert giving, but he became unnecessarily shy about doing so, preferring to stick strictly to joining in at open sings — but far too rarely, alas. Jay was an interesting cat to say the least, I looked after him in his final days and made the arrangements for the hospice. The evening he told me what he wanted me to put on his tombstone I had to get up and walk out of the room for a minute to collect myself. We spent a lot of time together while he was still in his house, he directed me as to what should be shipped to UCR Riverside, the first thing I sent was his collection of negatives. They were meticulously filed and categorized by name, thousands of them. He always told me about his “golden vocal chords” yet could not sing a bar due to age and radiation treatments. His legacy meant everything to him. Jay was a gentle, kind man and will certainly be missed by many. I thought he was going to say, “The rise and fall of practically everyone”, but it was simply his name, his wifes name, DOB / DOD, married 57 years and Syracuse University Class of 1953. He said he just wanted a little bread box sized memorial, we did a little better than bread box sized! (Needed a little more real estate for what he wanted inscribed) …So it was not so much what he wanted on it, but the cold harsh reality of what was coming next, sooner than later. I worked with Melissa Conway to get JK’s legacy into Eaton, a huge improvement for us — and we plan at Eaton to print some notable ones and display them in the collections room. Fans should come see Eaton, in Riverside CA — the largest sf and fmz and sf ms. collection in the world by far. Here is Jay Kay’s obit on the funeral home website.